Systematic Automation is an experienced global leader among UV curing system manufacturers , providing superior UV curing systems for inks, adhesives and coatings. Established in 1983, Systematic Automation has over thirty years of experience manufacturing superior printing equipment, setting industry standards such as developing the patented UVSP curing unit in 1998. We maintain a highly skilled staff with extensive knowledge in all aspects of the UV curing process combined with vast experience in UV radiation applications. We can assist you in developing your UV curing system to deliver maximum performance with optimum UV wavelength output. Our knowledge of the specific UV Nanometer (Nm) required for UV processes saves you time and money in determining the most appropriate UV curing system for your needs. If you are looking for experience and expertise in UV curing system manufacturers, Systematic Automation has decades of experience and provides proven, effective solutions. We manufacture UV curing systems for flat or cylindrical products, instantly curing inks or coatings on a variety of substrates including three-dimensional products. Our extensive knowledge and expertise means that you receive expert advice, top of the line equipment with professional service and support. 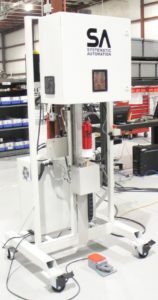 Systematic Automation manufacturers only superior equipment, rigorously tested for effectiveness prior to leaving our facility. Whatever your UV curing application requires, contact Systematic Automation, a most respected name in UV curing system manufacturers. We understand the UV curing system process, allowing us to provide a curing system that provides the most value to you and your customers. Our UV curing machines are equipped with touch screen controls, providing quick access to shift between modes with user friendly ease in operation. We offer a tri-power supply system providing either 200, 300, or 400 watts per inch (WPI), with a Programmable Logic Controller (PLC) that is expandable to integrate with your equipment. Removable casters allow for stackable power supply systems, with the ability for one touch screen to control up to ten stackable power supply units. Our revolutionary irradiator design provides maximum energy efficiency, with long life, high output, and uniform controlled cooling. Systematic Automation manufactures UV curing systems, and automated auxiliary equipment, giving you cost-effective operation with a streamlined efficient process. Our experience, expertise, and the ability to completely streamline your system with automated auxiliary equipment put Systematic Automation at the forefront of innovative UV curing system manufacturers. We are dedicated to manufacturing the best UV curing systems on the market, developing proprietary and patented technology to enhance the effectiveness of our products. We do this with an ever conscience effort to sustain our natural resources, making significant advances in our energy efficient products. Systematic Automation is a global leading manufacturer of UV curing systems, helping businesses and OEMs large and small improve their process control, while enjoying cost-saving automated efficiencies. Systematic Automation, Inc. has proven solutions to your UV curing needs. Our machines and components are rigorously tested for quality performance prior to delivery. Contact us to learn more about the specialized solutions adding value to your supply chain from top UV curing system manufacturers.